Philadelphia had the air of a city recovering from a natural disaster on Monday morning – the shuttered businesses, the detritus, the ubiquitous sense of fellowship and renewed appreciation for life among those on the mostly empty streets. Newscasters and cameramen walked around City Hall trying to capture remnants of the joyful storm. Finding interviews wasn’t hard – the verdant uniform worn by nearly all pedestrians announced that everyone had “been there,” and they were happy to talk despite their clearly potent hangovers. 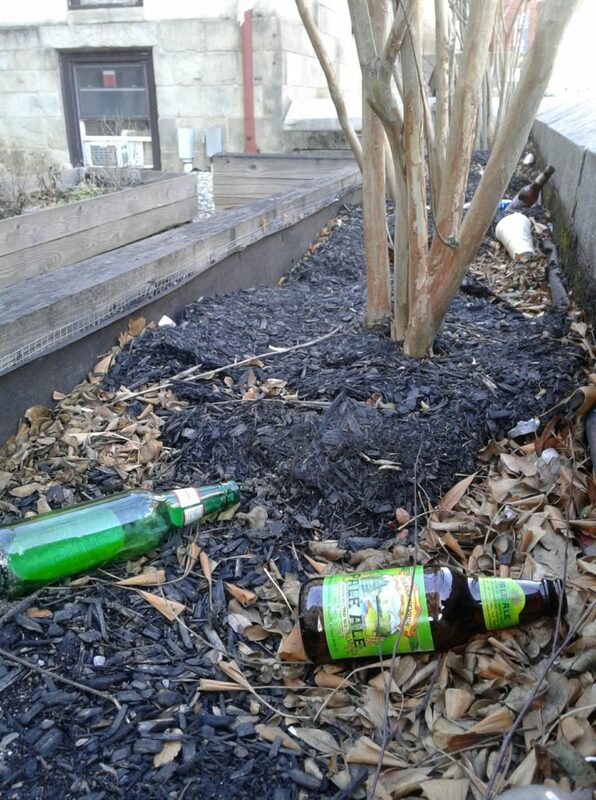 Walking south on Broad Street, green objects in the cityscape seemed to shine with a particular and meaningful brightness, from the beer bottles tossed into planters to the teal street-sweeping vehicle driven by a man who gave me a slow nod. 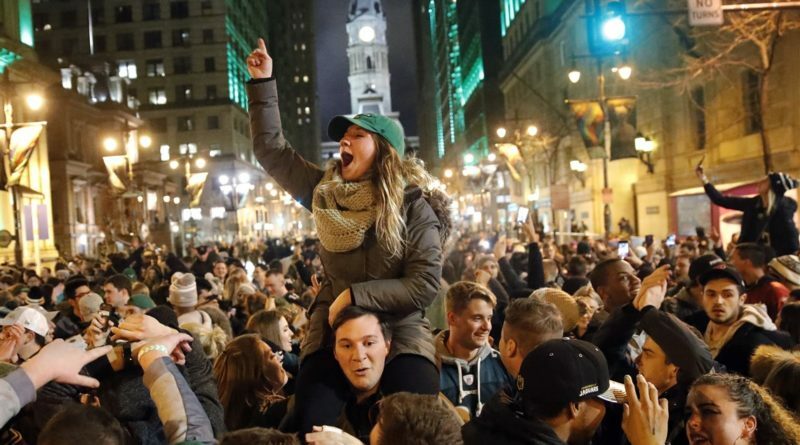 The sheer variety of Eagles apparel on display (hats, gloves, scarves, jackets, sweatshirts, and jerseys in a profusion of different fonts and shades of green) gave a sense not of conformity but creative cohesion – a celebratory mosaic. An impromptu economy of Super Bowl LII shirts had sprung up, with men hawking their wares on all four street corners at the busiest intersections. 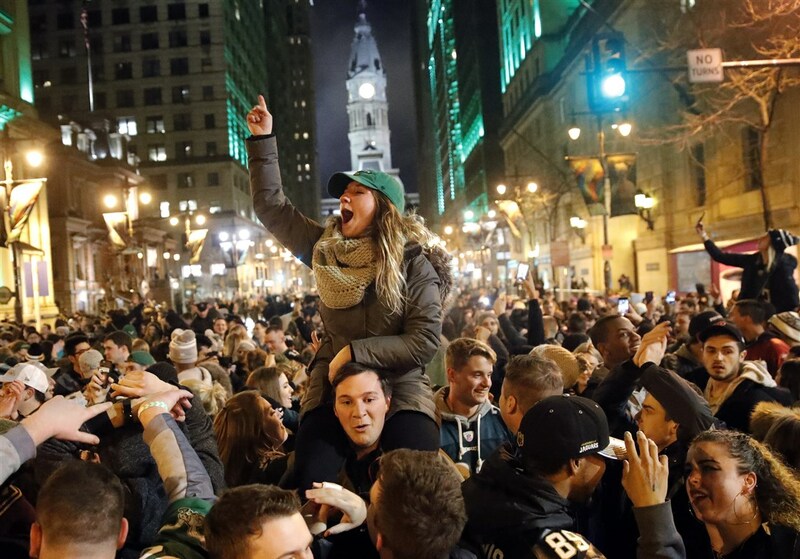 As a football dilettante and New Yorker who has never really devoted the time to get to know Philly as well as it deserves, I had a limited claim to Eagles joy, but the sense of community was infectious. 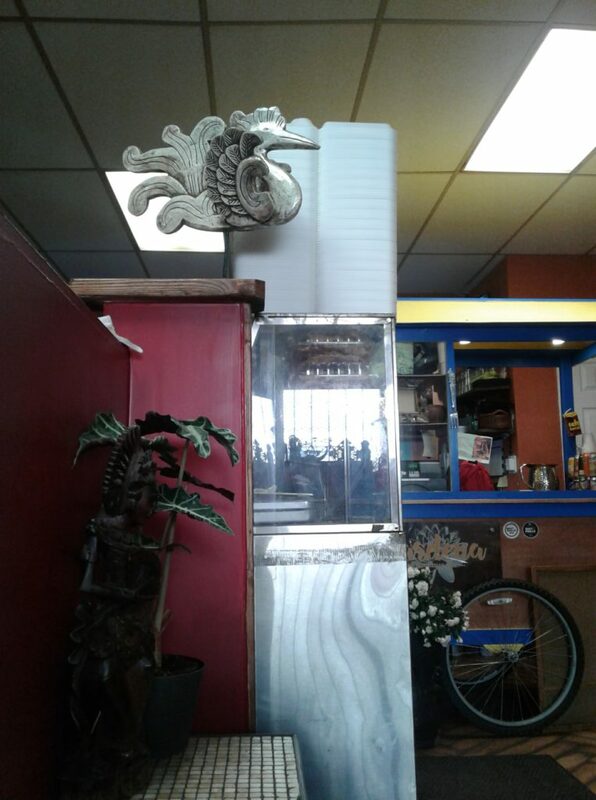 I had come into the city with the vague goal of visiting Hardena Waroeng Surabaya, an Indonesian restaurant in Passyunk, but mostly because I wanted to look around and it was a destination that allowed for a good long walk. As I got further south, regretting my lack of scarf and gloves, Eagles-decorated or otherwise, the streets emptied out even more, the silence interrupted only by the scrape of Yuengling and Bud Lite cans blowing across the sidewalk and the occasional group of men chanting E-A-G-L-E-S with a certain mechanical exhaustion. On S. 9th Street, seeking shelter from the wind, I stopped into Dasani’s Market, a family-owned business somewhere between a convenience store and a cafe. After the man in front of me tried to buy a newspaper (they had been sold out for hours despite it being 1 p.m.) I ordered a chai, and the proprietor, who I later learned was Mr. Dasani himself, assured me he would make one fresh. Waiting at a small red table in the corner and taking advantage of the magical conversational circumstances that made striking up a chat with any stranger a positive breeze, I asked how being in the city had been last night. Mr. Dasani had watched the game with his family near Temple, and said the crowds were raucous until about 1 a.m., when everyone had headed to City Hall. “The police helicopters were so loud it felt like “Apocalypse Now,” he said. We discussed the game, agreeing that the announcers had seemed very pro-Patriot before I felt compelled to admit that I was from New York and thus not a true Eagle. Mr. Dasani assured me that this was acceptable because the Giants had defeated the Patriots in two Super Bowls. “I think it was Chairman Mao who said, ‘The enemy of my enemy is my friend’,” he noted as I burned the roof of my mouth on the scaldingly hot but transcendently gingery chai. We parted and I walked through the Italian Market, which was deserted except for two outdoor grocers keeping warm by trash can fires. I bought some grapes (green of course) and kept heading south. In front of the South Philly Bar & Grill a couple prepared to depart in an Uber as if they were just then wrapping up their night and heading home, but not before a passerby asked them for a light. In a fit of wearied generosity, the woman offered him her lighter to keep. “Are you sure?” he asked. She gave him an extra cigarette. Pat’s was a relative hub of activity in the otherwise abandoned streets, a cheesesteak clearly being the only appropriate meal for the occasion, as a sort of Eagleswear for the stomach. I rested for a moment at an outdoor table next to a huge man in a Nick Foles jersey, eating my grapes and consulting Google Maps with numb hands. Watching passersby, it seemed like the usually impenetrable barriers preventing city dwellers from acknowledging each other had been taken down for a day, and any person in a car could feel confident that if he or she chose to yell “Go Eagles” at a brawny stranger, he would call back, “Yeah, baby. World Champs!” without even looking up. Feeling not so much refreshed as further chilled, I walked down E. Passyunk Ave, past closed coffee shops and dog boutiques, then turned right into a more residential area. Hardena Waroeng Surabaya seemed to have darkened windows as I approached, and my hopes of finding a meal sunk. However, to my surprise the door opened, and I was immediately blinded by a cloud of steam fogging over my glasses. The drastic increase in warmth and humidity made me feel that I had entered a new weather system, and when my eyes adjusted to the relative darkness of the restaurant enough to take in the Indonesian art covering the warm brown walls and the asymmetrical haircuts of the young post-grads seated at the tables, it seemed that I had left the world of the Eagles far behind. Hardena serves Indonesian specialities cafeteria-style, with a plate of rice and a generous helping of any two items for $8. The woman behind the counter offered to give me a rundown of what was being offered that day, and I settled on thick chunks of eggplant sauteed in a homemade citrusy hot sauce and a tofu and egg yellow curry replete with whole boiled eggs. The food was hearty and delicious, and I relaxed in the peace of the small restaurant, its only soundtrack the gentle clanking of pots and a quiet debate between two young women about the feasibility of polyamory. An Indonesian woman with two small daughters came in, and the elder tried to assuage her case of stroller jealousy by sitting on top of her younger sister as her mother ordered. The entire clientele became invested in the small drama, and an inter-table discussion of childrearing began. I wondered if Eaglesism was actually so different from the everyday spirit of Philadelphia, or if it was merely a heightened form of the communal feeling that is made possible by Philly’s small size and rootedness. I always bristle when people describe New York as unfriendly, simultaneously insisting that New Yorkers are perfectly friendly and that the demand that a city be “friendly” seems both dweeby and a trifle totalitarian, but there is something about Philly that makes me reconsider. It would be going too far to call Philadelphians “friendly” or “warm,” but from limited observation they have an unpretentiousness that makes true engagement easier. A man with dangling earrings got up and prepared to depart on a penny board, but not before putting on his Eagles hat. As he left, the conversation turned to the game.